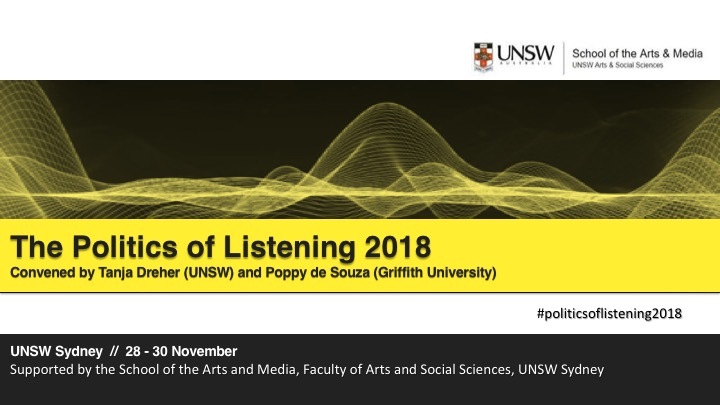 The Politics of Listening Conference was held 29-30 November 2018 at the School of Arts and Media, Faculty of Arts and Social Sciences, University of NSW Sydney. Inspired by the recent ‘turn to listening’ in media studies, cultural studies and political theory, this interdisciplinary conference brought together scholars, artist-researchers and cultural practitioners from Australia, Canada, New Zealand, the UK, South Africa and beyond whose work engages with listening in various ways: as a political practice; as a critical frame; as an alternative politics; as a contribution to justice and/or as an ethics of relation. It was the first international academic conference on critical studies of listening. As recent calls for a constitutionally enshrined First Nations Voice to the Australian Parliament remind us, the ‘right to be heard’ and calls to listen are central to addressing ongoing injustice and inequalities. The digital media environment offers proliferating opportunities for ‘voice’ and sharing stories, yet the attention economy works against the promise that previously marginalised voices will be heard. While politicians regularly embark on ‘listening tours’, public trust in processes of consultation and representation is minimal. The fundamental principle of disability activism – ‘nothing about us without us’ – demands that voices of disability be heard. Yet too often calls to listen are ignored or refused. Pushing beyond liberal celebrations of voice and speech, attention to listening has foregrounded a commitment to responsibility, responsiveness, vulnerability and openness. Critical scholarship in this area has done important work to shift responsibility for change from marginalised voices onto the institutions, practices and norms that condition who is heard, on whose terms, and to what effect. Scholars also draw attention to the difficult work of listening, its potential to unsettle, and its crucial role in disrupting the uneven flows of power and privilege invested in unjust social and political arrangements. The conference foreground the politics of listening as a vital intervention in contemporary scholarship, activism and practice. Keynote speakers: Megan Davis, Pro Vice-Chancellor Indigenous UNSW and a Professor of Law at the University of New South Wales. Leah Bassel, Professor of Sociology at the University of Roehampton, UK. Professor Davis is Pro Vice-Chancellor Indigenous and Professor of Law at the University of New South Wales and was a delegate at the First Nations National Constitutional Convention that delivered the Uluru Statement from the Heart. Dr Bassel’s most recent book is The Politics of Listening: Possibilities and challenges of democratic life (Palgrave, 2017). In conjunction with the conference, a one day postgraduate and Early Career Researcher workshop Listening beyond Liberalism was held on 28 November, convened by Tanja Dreher and Leah Bassel. More information can be found here. Dr Tanja Dreher is an ARC Future Fellow, UNSW Scientia Fellow and Associate Professor in Media at the University of New South Wales. Her research focuses on the politics of listening in the context of media and multiculturalism, Indigenous sovereignties, feminisms and anti-racism. Tanja’s current research project focuses on the politics of listening in response to community and activist media. Dr Poppy de Souza is an Adjunct Research Fellow with the Griffith Centre for Social and Cultural Research at Griffith University. Her scholarship critically engages with the ethics and politics of voice and listening in the context of changing media technologies, everyday cultural production, representational politics and political transformation, with a focus on sites of struggle, resistance and innovation.